Being Frugal and Making It Work: *NEW* Chocolate Chip Cookie Scented Laundry Detergent! *NEW* Chocolate Chip Cookie Scented Laundry Detergent! Nothing smells quite as good as fresh baked cookies! 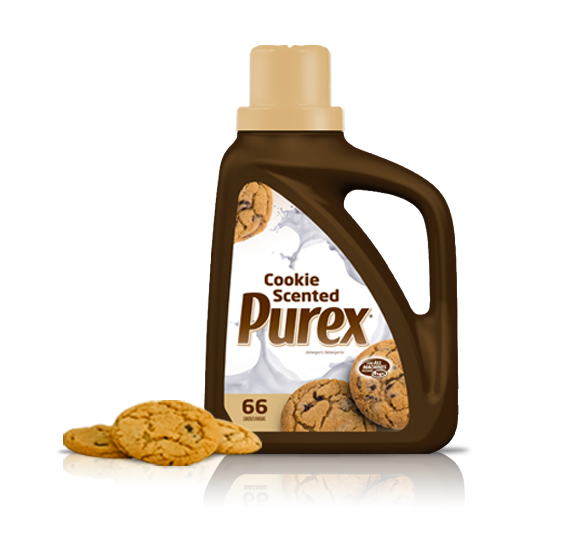 Now, you can bring the mouth-watering smell to your laundry, with Purex’s *NEW* Chocolate Chip Cookie Scented Laundry Detergent! I recently had the pleasure of trying this new laundry detergent, and it is simply amazing! It washes our clothes even better than it smells. As an added bonus, it leaves the entire house smelling like chocolate chip cookies! Who wouldn't love that? **Please note that Purex Laundry detergent has nothing to do with baking or cooking. Purex Laundry Detergent is not for consumption. This April Fool's joke was provided to me as a Purex Insider!